Maintaining a clean home may seem like a daunting task (especially when you factor in messy children and pets) but it turns out the key to a continually pristine house is a repetition of basic cleaning duties. From Simply Clean. Chances are you know that folding and putting that laundry away would be a good idea and dealing with that stack of mail instead of letting it pile up is probably the right choice, right? But do you know why you aren’t putting those tasks into motion? I’m guessing it’s because you haven’t really thought about it or you’re just too busy to care. Does that sound harsh? I hope not, I hope it sounds realistic and honest. I created this cleaning routine because I figured there has to be a way to keep a house clean most of the time with minimal effort. Trust me here and get ready to jump in to the simplest and most effective cleaning routine you can imagine. Let’s get started with the daily cleaning tasks—they’re the secret to keeping your home clean most of the time. The five daily tasks are things that you might be doing already but if you feel overwhelmed by them, start gradually and add one a week until you’ve added all five in. 1. Make beds. Quickly pull up your bedding and fluff those pillows as soon as you can in the morning. This will help set your mind for the day—your bed is made, hooray! If you have children, teach them at an early age how to make their own beds. Don’t go back and correct their work, just let it be. I’ve found that using just a bottom sheet and a washable duvet cover or quilt is the easiest way to make a bed. Just quickly pull the duvet or quilt up, toss the pillows on top, and it’s an instantly made bed! 2. Check floors. This is simple—just sweep or vacuum as needed. In my house, it seems like the broom comes out after every meal, but it’s a quick sweep under the kitchen table and it’s put away. If the day is a busy one, I might look past the floor until after dinner and just drag out the broom once. If you have pets, you might need to grab that vacuum cleaner or broom a little more often, especially if it’s shedding season. Any sweeping or vacuuming that’s done on a daily basis is merely for touch-up purposes; no thorough vacuuming is necessary. 3. Wipe counters. Wipe down your kitchen counters after meals if needed, and at least once a day, after dinner. Check the bathroom counters to make sure that they are clean and cleared off daily. If you’re in the habit of keeping makeup and beauty supplies out on your counters, consider putting them in a basket or drawer to keep the counters clear and easy to clean. A quick walk through the bathroom(s) in your home with a cleaning wipe or microfiber cloth and your favorite cleaner is all you need to do. Look for those little messes like toothpaste in the sink and any grunge on the counters. 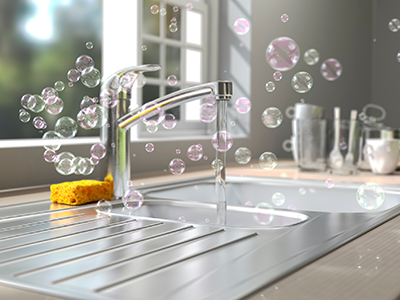 Keeping the counters wiped down daily makes it easier to maintain a clean home, and who doesn’t love clear counters? 4. Declutter. Pick up clutter during the day as you see it. This also includes dealing with mail on a daily basis as well as keeping counters and floors picked up. It doesn’t take much for clutter to creep in and invade your home. I find that dealing with it daily is the only way to avoid the overwhelming feeling that comes from a pile of papers on the kitchen counter or a pile of shoes at the door. Teach other family members how to deal with clutter by putting systems in place to manage the incoming papers, keys, shoes, clothes and anything else that adds to your clutter quotient. Simple items like a basket where the clothes pile up, a dish where keys get set, and a tray for incoming and outgoing mail and papers will go a long way to keep the inevitable clutter in its proper place. Having these systems in place will turn visual noise into visual serenity. 5. Do laundry. Do one load of laundry from start to folded and put away every single day. I think you’ll be surprised at how manageable it is. Simplify your laundry routine by using just the basics. No need for an arsenal of laundry supplies—pare it down to a couple favorites and keep those stocked. My best tip for laundry? Delegate! Teach your family members how to do laundry and you’ll be cutting your laundry time in half in no time. If you don’t have a washer and dryer and use a Laundromat or communal laundry room, this is most likely not feasible. But you can easily do a larger amount of laundry by running multiple machines at the same time. Use this to your advantage and plan it out. Keep a divided hamper or multiple baskets for your laundry storage so you can quickly toss your linens in the machines and get your loads running. Fold your laundry right away and put it away as soon as you return to home to avoid the laundry basket stare down. 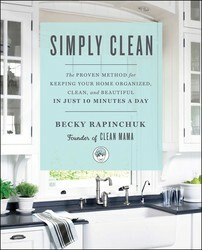 Spruce up your home and ditch the chemicals with 3 of Becky’s natural cleaning recipes.